Joe Louis Walker will be appearing on TBS’s Conan on Monday March 5th, 2012. JLW and his band will perform the song “Ride All Night” from his new Alligator Records debut CD Hellfire. Walker is no stranger to the music business. His discography includes 23 albums and 2 DVDs. And throughout his illustrious career has gathered four Blues Music Awards, including the 2010 Album of the Year Award for Between A Rock And The Blues. Walker has recorded as a guest with some of blues most distinguished artists; including appearances on Grammy-winning records by B.B. King and James Cotton. At 16 years old Walker held the position of house guitarist at The Matrix in San Francisco. The Matrix was a significant place in the influential years of the San Francisco music scene. It featured not only rock bands, but many blues and jazz artists. It was a favorite spot of journalist Hunter S. Thompson in the late 1960s. The club was briefly mentioned in his book, Fear and Loathing in Las Vegas. It was The Matrix where Walker opened for a diverse assortment of artists like Jimi Hendrix, Thelonius Monk and Lightnin Hopkins, just to name a few. Walker met guitarist Michael Bloomfield in 1968 and they became good friends. The two shared an apartment for years; remaining friends until Bloomfield’s death in 1981. Bloomfield would be an early influence in Walker’s rock oriented style. 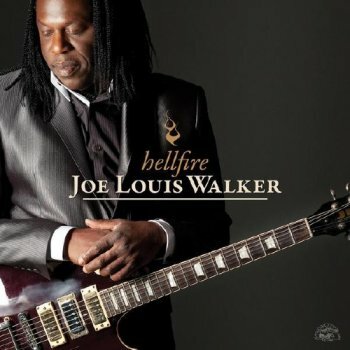 Since then, Joe Louis Walker has played in numerous groups and genres, including gospel, R&B and some good old rock n roll. On Hellfire, Walker’s latest Alligator Records release, he scorches with rocket fueled passion; possessed with an energetic rock blues feel. Walker describes Hellfire as the most deeply soulful album of his career. You can go to one of my previous articles I wrote on JLW a few years back. There you will find further bio information and video performances of Joe and his band. How familiar are you with Joe Louis Walker’s career? Will you (or did you) watch Joe on Conan? What are your thoughts? Please leave any comments in the area below. You’re input is encouraged and helps enhance the posts you read here. Certainly heard a lot better. What is so special about the band? Joe Louis Walker has been around for a very long time. He’s played with a wide range of diverse artists over his 45 + years of gigging. I really enjoy listening to his unique style; very JLW…. To have an artist who has worked so hard all these years get a big gig like that on TV is what this post is really all about. Not everyone’s cup of tea, but for me and many others, Walker has plenty of the right ingredients to be very soulful indeed…. I do appreciate your comments though… Thanks!